I did it! I took the plunge and signed up for 30 Days of Lists for March 2018. My daughter, Amy has hosted this project in the past, with her friend Kam and although I’m going to be pretty busy in March, I thought I could squeeze in some time to do this for at least some of the days. I’m not setting expectations to create journals or scrapbook pages or even create a book or anything, but I THINK I can at least write a list a few days each week. You see, I’m not even committing to doing it every day. I’ll just take it one day at a time and see how it goes. I’m already behind, but hoping/planning to do be able to get creative and share some of them. Holiday Turkey Recipe-Amazing Every Time! I’m sharing this recipe for those of you who are looking for a great easy way to roast your turkey this year. Our family has used this one for decades and we always get rave reviews about how moist and tender it is. Never dry! Make note that the turkey needs to be started in the oven the night before you plan to eat it. And if it’s not quite thawed the day before, you can quick thaw it by following these instructions from Butterball. It’s great because you can put your turkey in the night before. YES, the NIGHT BEFORE you want to eat it and you wake up in the morning with the delicious aromas filling the house. Another awesome thing about this recipe is that even if you cook a large turkey, it comes out moist and tender. 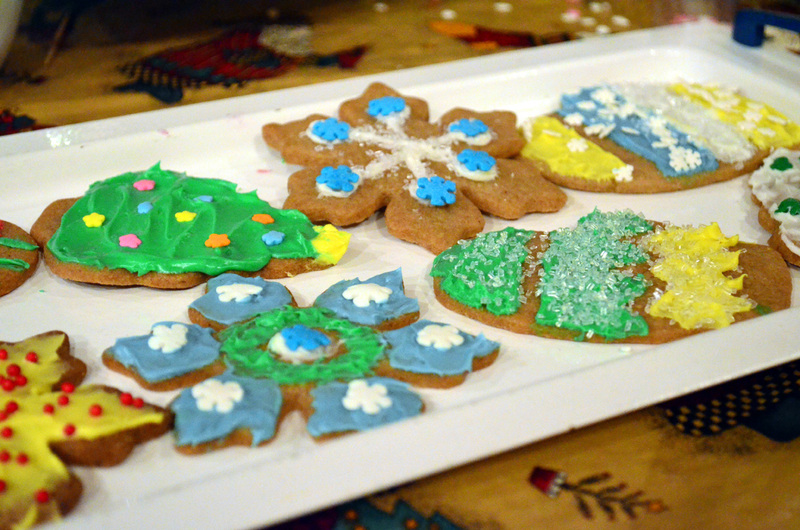 I first found the recipe in a book by Emilie Barnes called “The Complete Holiday Organizer”. I was going to add a link to buy the book, but it appears to be out of print. Sorry. For those of you who haven’t heard of her, she was a homemaking guru before anyone ever heard of The Martha. I’m going to include the text from the book to give you some background. I hope you try it and enjoy it. It’s SO easy! ” Trust me on this one. The white meat melts in your mouth. This is a SLOW roasting method, but once in the oven, you can forget it until it comes out. Set the turkey BREAST side down on a rack in a roasting pan (this bastes itself, making the white meat very moist). This is important. The turkey can go in the oven the night before eating it! Example: I have a 22 pound turkey. At 5:00 p.m. Thanksgiving Eve I put the turkey in the oven prepared at 325 degrees for one hour. I turn the temperature down to 185 degrees and leave the turkey uncovered until it’s done the NEXT day about 10 or 11 a.m. Although the cooking times seem startling at first , the meat is amazingly delicious, juicy and tender. It slices beautifully and shrinks so little that a turkey cooked at regular temperatures no longer tastes good. It cannot burn so it needs no watching. It literally cooks itself. ” I do feel the need to baste every once in a while, but that’s probably more habit than anything, besides I like to open the oven and smell the turkey. A good rule for timing is about 3 times longer than a standard recipe. For example: a 20 pound turkey that normally takes 15 minutes per pound to cook would take 5 hours. This slow cook method would be 3 times 5, so it equals 15 HOURS to cook the slow way. A smaller turkey cooks 20 minutes per pound, so an 11 pound turkey takes 3 hours, 40 mins standard, times 3 which equals 11 hours for the slow roast way. ANOTHER IMPORTANT NOTE: Many newer ovens are set to automatically turn off after 12 hours (I guess it’s assuming that you forgot to turn it off.) You don’t want your turkey sitting in an oven for hours without any heat. It will be uncooked and dangerous to eat, plus you’ll have lots of unhappy and hungry guests come dinner time. If your turkey will be reaching the 12 hour mark while you’re sleeping, just before you go to bed, be sure to turn off the oven temperature for a few seconds, then turn it back on to 185 degrees. This will reset the oven’s internal timer so as not to automatically turn off. Be sure to make note of any time that 12 hour window ends, so you can be sure to “reset” the oven before that. Now here’s the cool part. Once it’s done, it will NOT overcook or dry out. You can leave it in the oven an additional 3 – 6 hours and it will still be perfect! Thus your roasting can be adjusted totally to your convenience. So allow yourself plenty of time. It’s better to put it in a little early than too late though, since you want to be sure that it’s done. That’s it. That’s all you need to do. Can it be more simple? Many standard recipes call for allowing the turkey to “rest” outside the oven for about 30 minutes before cutting. This can be done with the slow roast method as well. Besides allowing the juices to settle in the turkey, it also allows you to have your oven free to cook or warm other items for the meal just before serving. I’ve been using this recipe for probably 25 years and have never been disappointed when I followed the directions. One item I need to point out. If your family actually puts the whole turkey on the table as a nice presentation, then you need to know that cooking it breast side down will not be quite as pretty as what you’re accustomed to. There will still be some crispy skin on the top side, but the breast will not be crisp since it was on the bottom of the pan. If you’re like our family and you just take it out of the oven and slice it up on platters, no one will even know that you cooked it upside-down, except that it will taste AMAZING! Have fun and let me know how your dinner turns out. If you missed the beginning of this list you can find it here. I’m realizing that this list could go on for days, so we’ll see what happens. 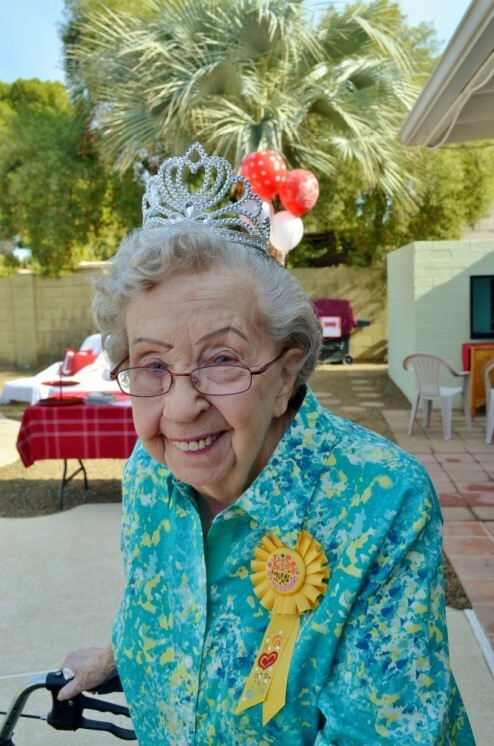 I hope you enjoy learning about what a wonderful mother and person my mom was. 11. Saturday was usually Mom’s shopping day. She didn’t learn to drive until she was in her 50’s, so when we were young she depended on Dad to take her to the A & P grocery store on the weekends. Can you imagine only being able to go to the store once a week with 8 hungry mouths to feed? She did a great job of stocking up to make things last for the week, but I remember drinking powdered milk at times either because she couldn’t afford to buy more or she couldn’t get to the grocery store. I’m guessing her weekly trips were also a time of solitude that she looked forward to, but sometimes she’d allow one of us to go with her. Those were precious times when she let us help her choose food for the week and maybe even get a treat. 12. Mom would sometimes bring home delicious fresh rye bread, deli meats and cheeses on shopping day. They never lasted much more than a day because they were favorites for the whole family. That’s where I discovered my love for a good deli meal. We had Munster, Colby, Cheddar, Longhorn, Swiss and American cheese with fresh sliced Ham, Turkey, Roast beef, Braunschweiger and more. In the summer sometimes we’d add giant slices of Beefsteak Tomatoes and fresh lettuce from my grandmother’s garden. Mmmm! 13. As the family grew, Mom and Dad gave up their bedroom so that all of us kids could have one. They converted the living room to a sleeping area at night and added a sliding door for privacy. They kept their clothes in my oldest sister’s room. I imagine that was quite a sacrifice since they had no place to get away until we were all asleep in bed. 14. 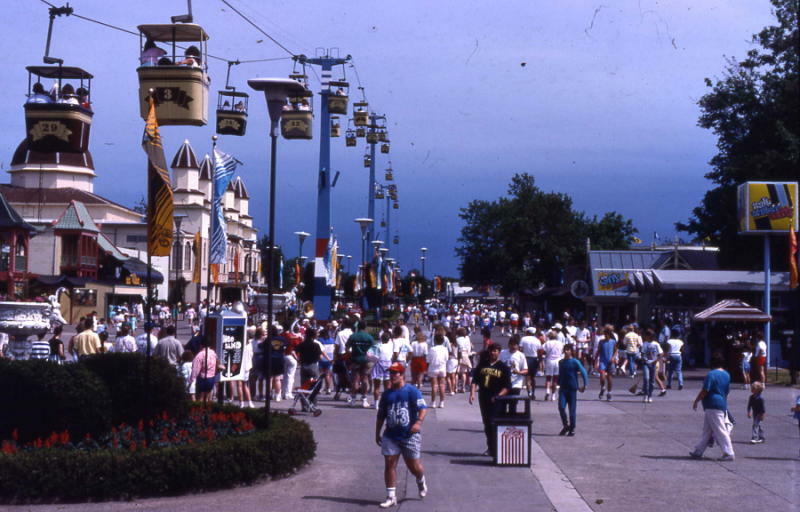 She often planned a once a year summer day trip as the sole adult with all of us kids to the northern Ohio amusement park, Cedar Point. We’d get up early in the morning and walk a block or so to the highway to catch the bus heading for Sandusky, then ride a ferry boat from Sandusky across the bay to the park. We spent the whole magical day riding thrill rides, seeing musical variety shows, and traversing the skies on the overhead sky ride. 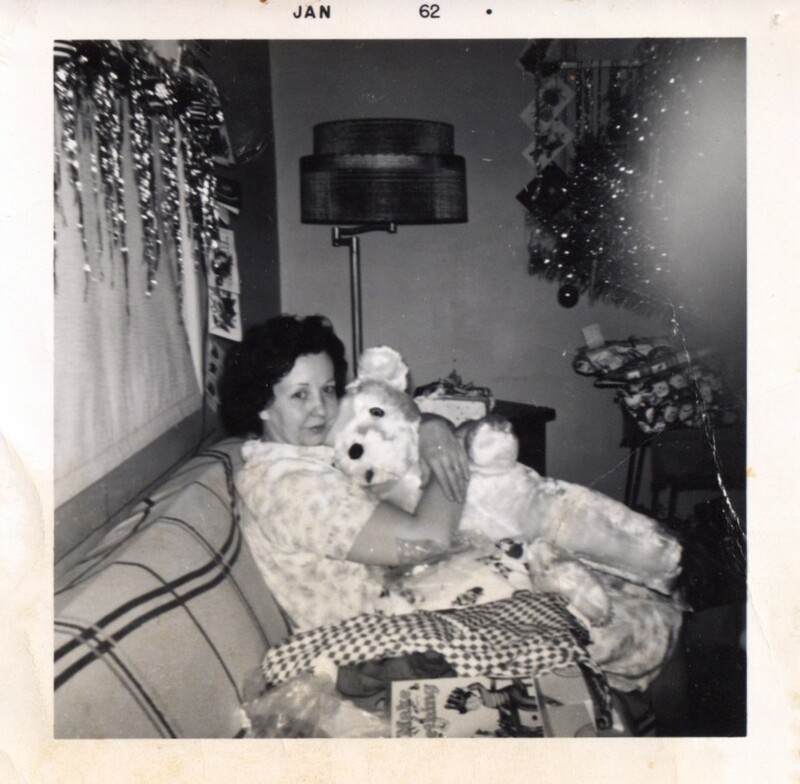 She always packed a substantial lunch for us, then later in the day she’d buy those famous Momma Berardi’s homemade French Fries and salt water taffy to hold us over. We’d stay as long as possible to squeeze out every drop of fun until either my dad came after work to pick us up or we caught the last bus for home. 15. 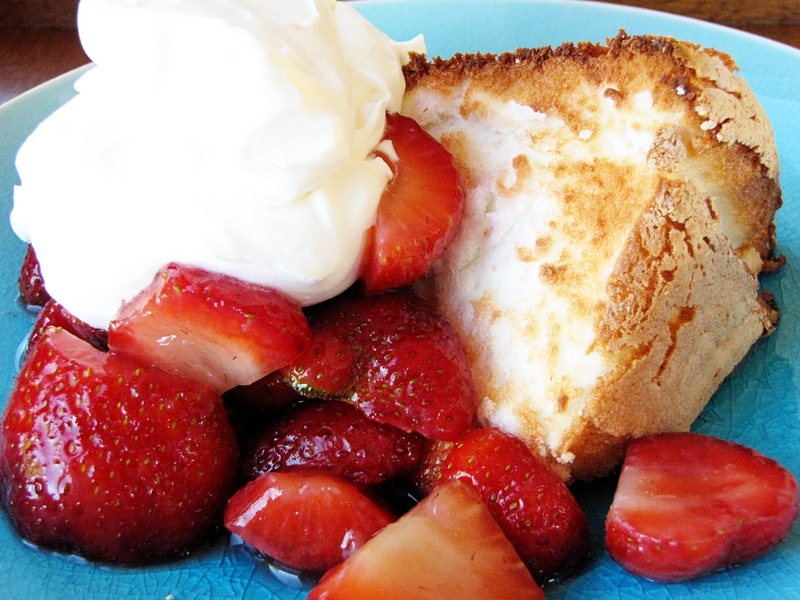 Mom let us choose what kind of cake we wanted for our birthday and I often requested freshly baked Angel Food cake with strawberries and whipped cream. I can taste it now! 16. In August of each year she took each of us separately on a school clothes shopping trip – I recall riding that morning bus in the other direction this time – to the Midway Mall in Elyria – just Mom and I, eating lunch at the restaurant in the mall and buying new shoes and clothes for the upcoming school year. This was probably my favorite day of the year. Not because I was shopping, but because I got to have my mom all to myself for an entire day! 17. A limited budget and endless creativity brought forth unique homemade Halloween costumes for us each year. I wouldn’t be caught dead in one of those unimaginative store-bought ones. 18. 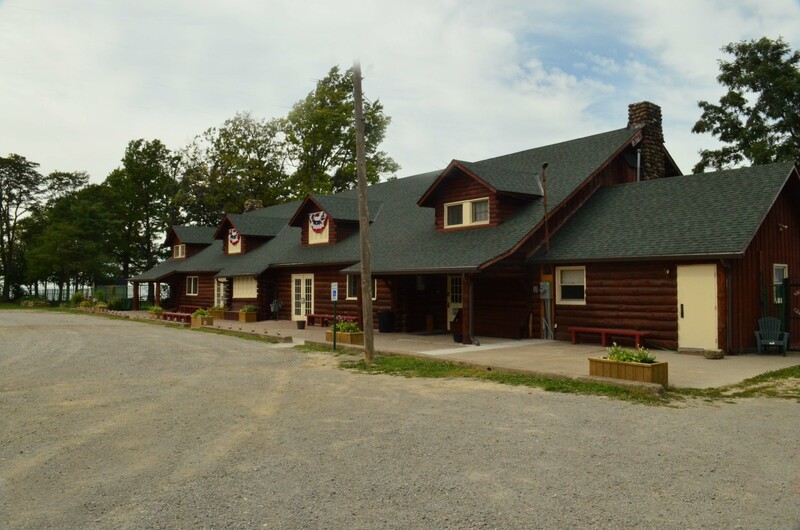 Halloween parties at the Vermilion-on-the-Lake (VOL) Clubhouse were organized by her. She dressed as a witch and made witches’ brew using dry ice. I remember dunking for apples, fishing for prizes with a clothes pin on a string, costume contests and so much more. 19. There was a Christmas play one year, written by my sister, Sharon and produced by Mom at the VOL Clubhouse with the neighborhood kids. The stage background was painted by Wayne Crozier, complete with his signature mouse hiding in the scene. 20. Each year she creatively decorated our 5 foot silver aluminum Christmas tree with matching colored glass balls. Since there would inevitably be breakage in the process of unpacking and packing the delicate glass, the following year she’d buy a set of a different color, then the 3rd year she’d use a combination of the previous years. The tree was often perched on top of a table up and out of the way of little hands and active pets. You can see a sliver of the tree in the background below. I remember spending what seemed like hours sitting in the living room gazing at the ever changing tree with the colored light wheel casting shadows on the walls and ceiling. It was mesmerizing! Looking over these memories I can see so many things that I learned from my mother. How to use my creativity in decorating, sewing, having fun. How to shop wisely, how to plan ahead for special activities, the importance of saving where needed, but splurging once in a while…so many lessons that I still use today. I’m so thankful for her giving and teaching spirit. What a gift it was! There’s a bit more to come, so stay tuned. Thanks for reading! Does this bring to mind some things that you’re most thankful for about your mother? O.k., here goes! Journal your Christmas 2012 has begun. Attempting to do a blog post each day in the month of December. Already resigning myself to the fact that it won’t happen every day, but maybe I can post a photo and a caption at least to document the day. Then later I’ll put it into a Blurb book like my clever daughter did last year. Although she was doing a different project, called December Daily. At times I’ll be focusing more on documenting traditions, holiday activities, etc. with Shimelle and her gang at Journal Your Christmas. I’d love to have you join me. It’s been a busy and somewhat non-traditional month for us. As you’ll see from these photos, there’s been a good amount of time spent with those we love, but somehow things were busy in other ways too. We also went to the Musical Instrument Museum (the MIM) for our 34th wedding anniversary on Dec 9th, celebrated the holidays with a few of the non-profit groups that I work with and had a lovely evening with some other dear friends. All of those activities don’t have pics posted yet, but hopefully I’ll get to it. I’m not quite sure how the month got away from me, but we didn’t decorate inside the house until December 19th which is VERY LATE for me! Originally we weren’t expecting to have any gatherings at our house this year, so I guess that gave me the freedom to put it off. Then we found out that we were hosting our family gathering, so I got busy and did a few things. We still have at least one more celebration to come with our son, Kevin when he returns from being overseas in early January. That will be a special time to have him back home and in the U.S. hopefully for a very long time. 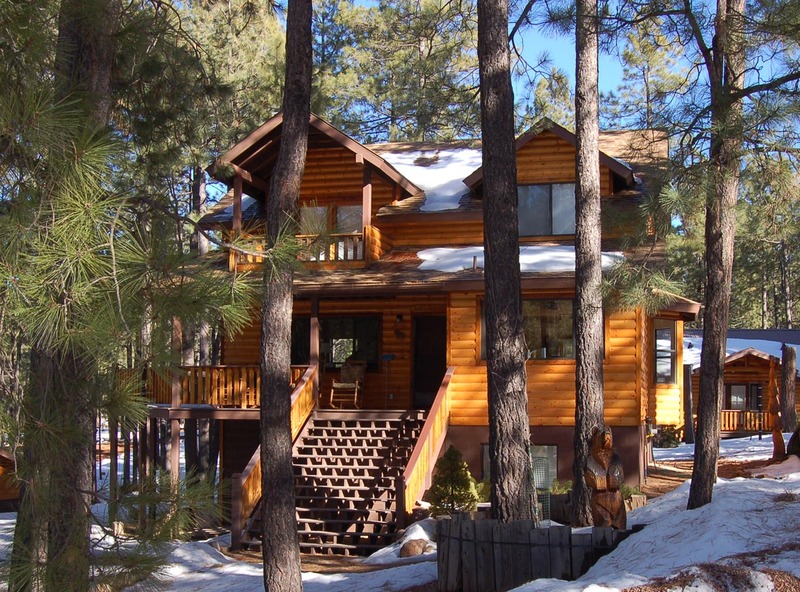 On Thursday my husband and I came up to use a friend’s cabin in Forest Lakes, Arizona with another couple. These first two photos are courtesy of my friend, Julie. We enjoyed some deep conversation and one of our favorite card games of Nertz. We have been playing Nertz with some of our best friends since the 70’s and love it! Funny thing, just as I was typing this I decided to look up Nertz rules so you could play the game yourself and I discovered that there’s a National Nertz Association AND that we’ve been playing it incorrectly all along. Oh well, we’ve had so much fun and the difference is negligible. We’ll have to try to play the “right” way the next time though. It started snowing on Friday night just as Andy & Julie were leaving. We went to bed with some light snowfall and by this morning it didn’t look safe enough to drive out. We had other friends who were hoping to come up today, but the drive is too dangerous, so it’s just the two of us now. I’m sitting at the kitchen table looking out at this gorgeous view of the snow gently falling. An instrumental version of “Christmas Time is Here” just started playing on the iPod (just like the version in A Charlie Brown Christmas). Even though we’re well into February it feels appropriate somehow. Snowfall always reminds me of the holidays. Growing up in Ohio, we always dreamed of a white Christmas. I continue to long for the confluence of snow and the winter holidays especially now that we live in Phoenix and have to travel to the mountains to enjoy it. Today the snow fluctuates from a light dusting, to big fluffy flakes, then when the wind kicks up it starts to swirl between the trees. At times it turns to a slushy rain, then back to snow. Even though it’s after 2pm, the sky is dark and gray. We’ve heard that this is just the beginning of the storm that’s supposed to last through tonight and well into tomorrow. Worst case scenario is over 20 inches of snow in this storm, but because it seems to be wet (for now) it doesn’t seem to be accumulating as quickly as we’d expected. We had a power outage this morning and for some reason the back up generator didn’t turn on. We were ready to brave the storm and hit the roads, but while we were weighing our options, packing, etc. the power came back on, so we decided to stay where we’re safe and sound inside the warm, cozy house. 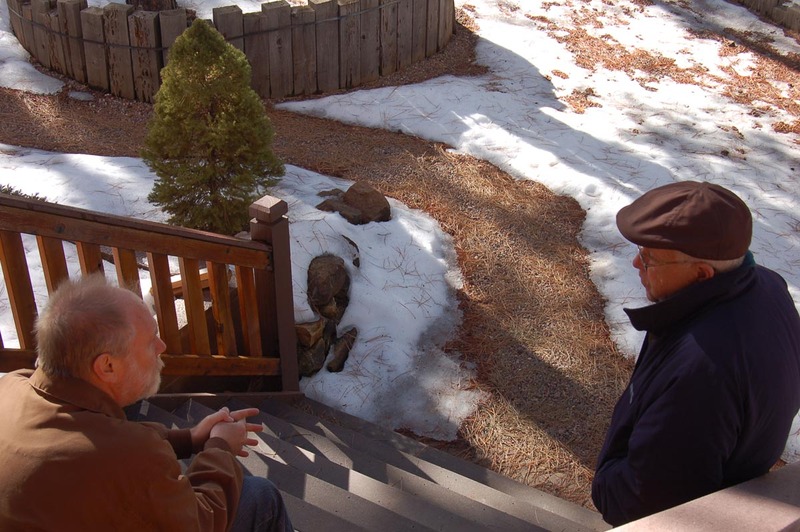 We’re in a neighborhood reached only by dirt roads and we talked to a neighbor who said that they almost slid into a ditch in their truck with snow tires this morning, so we’re not going to take a chance on the drive out and down the Mogollon Rim Highway. Neither of us have driven much in the snow and our car doesn’t have snow tires or chains so we’ll settle in here. We were planning to stay until Sunday anyway and we have plenty of food, even if we have to stay for an extra day or so to wait for the snow plows to come around. Now all that’s left is to enjoy the quiet solitude with my sweetie, open a bottle of wine, light a fire in the fireplace and pray that the power stays on…oh, wait. We might want to conserve that firewood just in case we do lose power again. 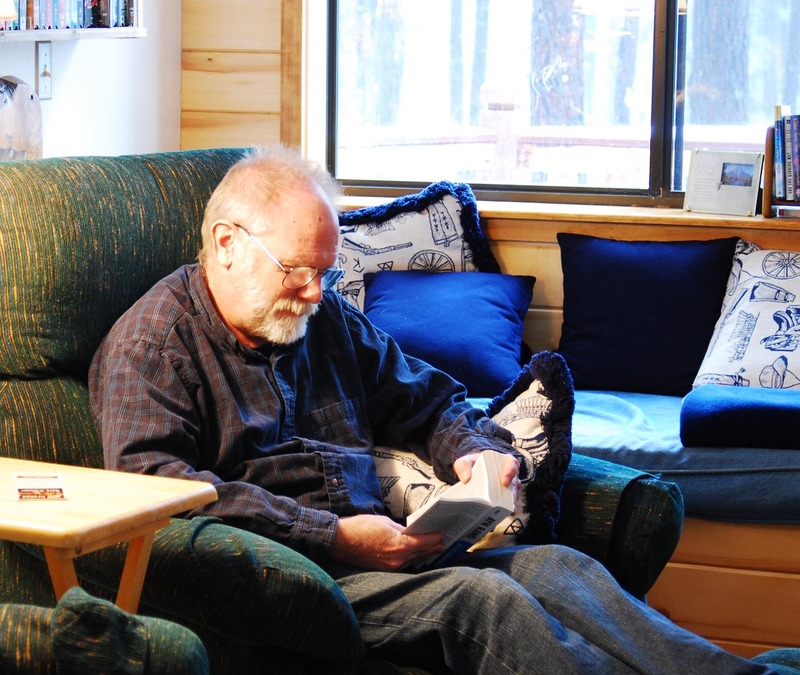 Terry’s working on finishing the book, Atlas Shrugged. 1069 pages. He’s almost there. Click to enlarge this pic to get a little bit of an idea of the snowfall. It changes second by second and the photos really don’t do it justice. It’s absolutely amazing! I’m not sure I’ll ever get out of this spot. 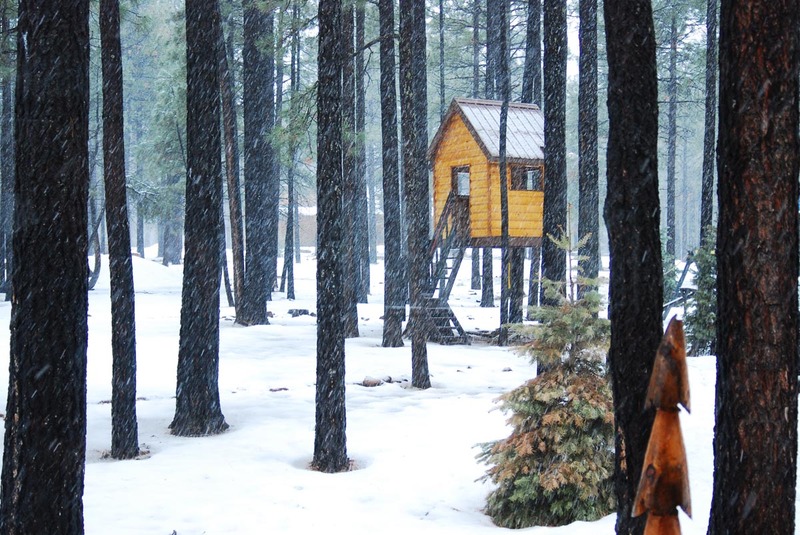 It’s like watching a real life snow globe, only much more magical. Are you like me and hate to throw away all those beautifully designed Christmas cards? I always hold on to them thinking that there must be some way that I can re-purpose or recycle them. Well here’s a fun and easy idea that can be used each year and is easy enough for youngsters to do it as well. And the instructions are so easy! Select a palette of coordinating hues to create a whimsical wreath. Cut greeting cards into different-size circles (or other fun shapes). Arrange the circles into a wreath shape, overlapping as desired. Secure with crafts glue. Machine-stitch over the top using coordinating or contrasting thread. 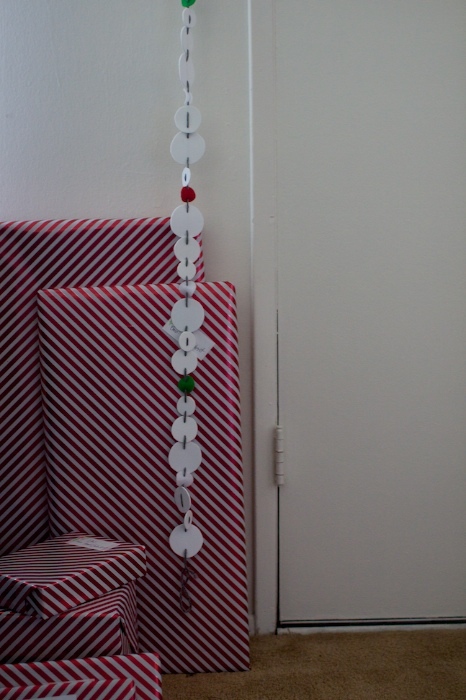 Attach a ribbon to the wreath with a colored paper clip and hang. In looking at this project, it might make it easier to cut out a donut shape as a base out of cardboard. And if you don’t have enough coordinating colors in your greeting cards this year you can always keep the circles from one year to the next until you have what you need to make your wreath. You could also cut up your Christmas or other card fronts to use as embellishments on your scrapbooking or other craft projects as well. 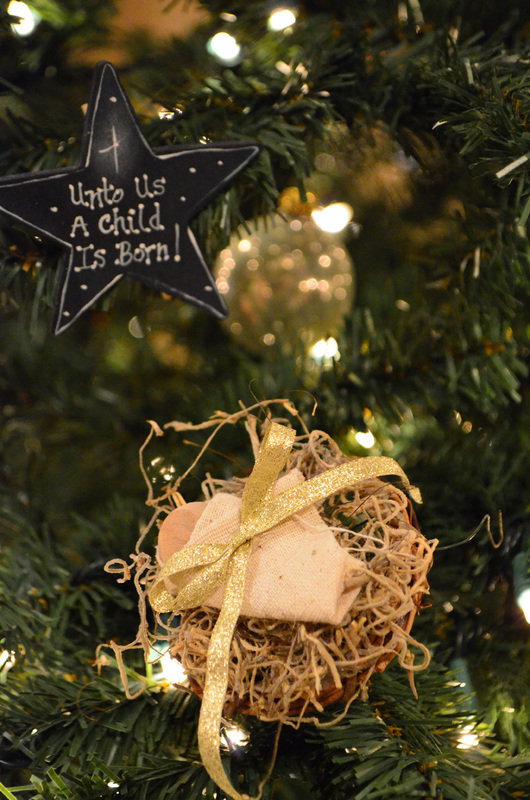 I found the idea along with many other great craft and organizing ideas at the Better Homes and Gardens website. I love browsing through all their wonderful tips, and craft suggestions. Sign up to get their emails and you won’t miss another helpful hint. Or…here’s another idea! 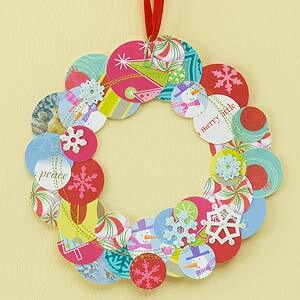 How about using those greeting card circles to make a garland like Amy did here on Lemon and Raspberry?